Volume 1 Memories - Anecdotes of a Modern Day Saint is a transcription of all the oral histories contained within the Memories video series. Now instead of fast forwarding to that memorable story that you want to retell to someone, you can now just turn to the page for the exact quote. Contained within Volume 1 are the interviews from Part 1 through Part 15. 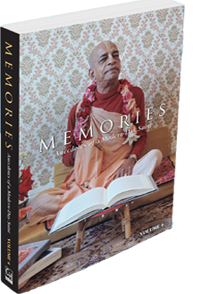 Both Volume 1 and 2 include photos of every devotee who shares their memories as well as never before seen color photos of Srila Prabhupada with his disciples. For additional discounts and to save on shipping, contact CH Books at 310-204-1234 for orders of more than two books. Volume 2 During the 25th Anniversary of the Disappearance of Srila Prabhupada, Mother Prasanti described that day as her favorite day of the year because that is when stories about His Divine Grace are told. 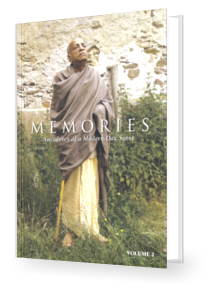 As in the early days when a devotee would return from being with Srila Prabhupada and everyone would gather around wanting to hear the nectar from his or her association with the pure devotee, so it is now that we have the chance to hear from all those devotees in Volume 2 of “Memories-Anecdotes of a Modern Day Saint”. 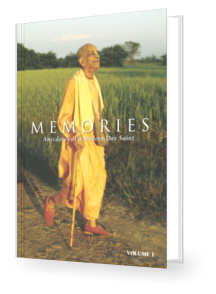 Volume 3 This third volume in the "Memories Anecdotes of a Modern-Day Saint" takes us from part 29 through part 45 in the DVD series. (See our website for the list of devotees). Each chapter contains photos of each devotee so we can attach a face with each story. We guarantee every reader to be thoroughly enlivened and inspired in their devotional service to Srila Prabhupada. 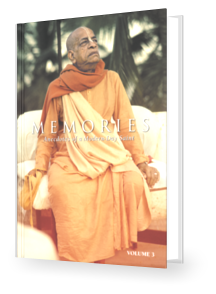 Volume 4 in the "Memories" series contains 15 chapters of incredible nectar in the form of instructions and inspirational stories about His Divine Grace A.C. Bhaktivedanta Swami. The book, covering the transcriptions from DVD 46 to 60, is a definite page-turner and is guaranteed to enliven every reader. Enjoy!